More than 50 years later - with 9 EP which excludes those that were not sung by Kassim Slamat - with at least 3 songs that hit the Singles Charts - several other EP that were recorded together with singers like Rafeah Buang, Ahmad Jais and Ahmad Daud. After all that has been written in regard to my limited perspective of the Singapore music scene of the 60s, (Born in 78 I was) The Swallows were destined for doom - an industry that has failed to see a resurrection in its music & film industry which was once-touted as the Hollywood of the East. Kassim Slamat & The Swallows will be remembered by some as a bunch of humble and talented kampong boys who did fairly well in the fledgling youth scene of downtown Singapore. (The music industry in Singapore never took flight again). Not too bad for a bunch of kampong lads who stood out without any formal music training to begin with. As a testament to this, The Swallows most popular number entitled 'La-a-Obē' as it was originally registered is still enjoyed by a new generation of fans that are singing to its tunes on popular video sites. 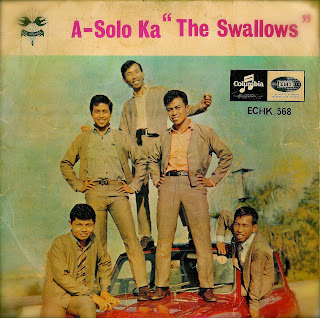 The Swallows jacket as seen on the A-Solo Ka EP sleeve. at The Malay Heritage Centre, Singapore. 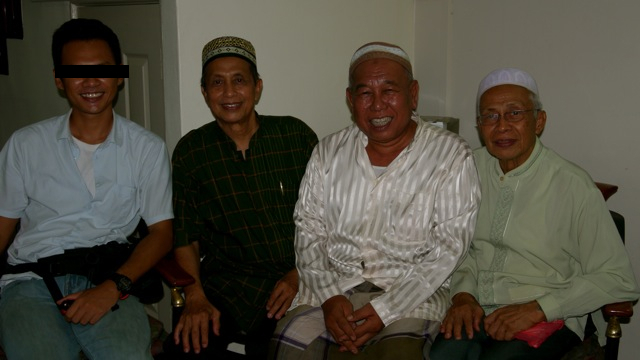 From Right: Haji Kassim Rahman, the late Haji Affandi Hj A. Rahman & Haji Yusope Lamat taken on 14/05/2010. The origins of the song 'Mak Itti Mak Illa'. 'La-a-Obē' on the German airwaves? Can this be verified? All this ... and much more hidden treasures that has to wait ... as I brush up some grammatical errors. i love hearing all of their song.. its reminded me of my late atok sdare tok andi aka affandi haji a.rahman..
Haji Affandi, affectionately known as Pak Pandi will be missed by many.He was truly the leader of the band when he showed signs of his leadership during the video interview. (Even though The Swallows were on a permanent hiatus since the late sixties). He was my inspiration in my music career..
btw wat happen to the rest of the members....Bassist & Lead Guitarist? thx erwin for the updtes..
i grew up in the 90's and was introduced to swallows thru LaObe . since then i searched and bought most of their EPs incl the ones with Ahmad Daud, Rafeah Buang & Kartina Dahari. no doubt they are an inspiration to the young bawean generation like me.